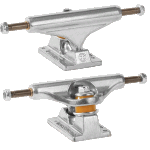 Independent is high up the list as one of skateboarding's most iconic brands and leaders in the manufacturing of skateboard trucks, hardware, clothing, and accessories. 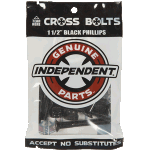 Manufactured in San Francisco and based out of Santa Cruz, USA, Independent was established in 1978, and has been setting the industry standard for 39 years. 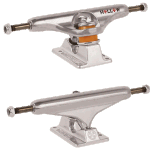 Independent trucks are known for quality and all round performance with a precise turning geometry. 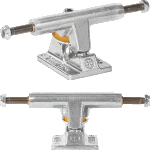 Indepent trucks, aka Indys, are the go-to for transition and pool skaters, as they offer superior control and stability when pumping for speed. Stage 11 Indys have a re-designed yoke (the inner metal part of the hanger that separates the bushings) to help avoid hang ups. 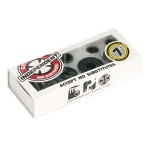 Independent hangers are designed with enough clearance to run 56mm wheels without risers. Indies are a great option for street / park riding. 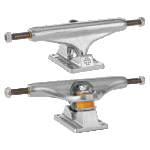 They offer a good all round grind clearance, most notably through the outer face of the baseplate that keeps the wheels clear of surface during a tail or nose slide. Indys are also a great choice for side-walk surfing or bombing down the hill to the train station. They have a very accurate turning radius, allowing for greater speed with every pump. more speed. Indys also have a unique wide swing motion when carving, to allow the board to drive more deeply into the turn. The Independent team rider list reads more like the skateboarding hall of fame, boasting a team of over 250 of the biggest names in the skateboarding industry like Steve Olson, Tony Hawk, Steve Caballero, Christian Hosoi, Bucky Lasek, Justin Figueroa, Ryan Sheckler and Leo Romero to name just a few. 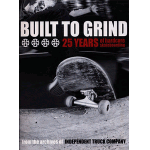 This huge team has helped the Independent truck company research and develop their products over nearly 40 years, so you know you're getting the gold standard components for your skateboard.